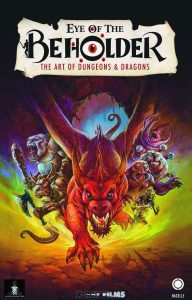 The Nacelle Company announced today it has acquired the documentary filmEye of The Beholder: The Art of Dungeons & Dragons. The Nacelle Company announced today it has acquired the documentary film Eye of The Beholder: The Art of Dungeons & Dragons. Eye of the Beholder: The Art of Dungeons & Dragons is an exciting new documentary that explores the history, influence, and stories behind the artwork that helped create the world’s most popular role playing game. Eye of the Beholder features more than 40 interviews with legends in the world of D&D and modern fantasy illustration, including Larry Elmore, Jeff Easly, Clyde Caldwell, Brom, Tony DiTerlizzi, Todd Lockwood, Erol Otus, Margaret Weiss, and many more. The documentary also features former company insiders, game designers, authors, and fans. Eye Of The Beholder: The Art of Dungeons & Dragons is a celebration of the art we all love so much. The film was directed by Kelley Slagle and Brian Stillman, the latter of whom who is known for Plastic Galaxy: The Story of Star Wars Toys and producing The Toys That Made Us. Eye of the Beholder first screened at the Gen Con 2018 Film Festival, where it won Best Documentary and sold out three shows. Furthermore, the documentary won Best Feature Documentary at the Clifton Film Celebration, where it was also nominated for Best Overall Film. “Watching Eye of the Beholder is like being teleported back in time to rap with iconic artists about what it was like working for TSR in its heyday. I’ve been lucky enough to talk to many of these artists, but even I learned new information by watching Eye Of The Beholder. This is a must see for any fan of D&D or fantasy artwork!” said Luke Gygax, Founder, Gary Con; Son of D&D Co-Creator Gary Gygax. “I’ve played Dungeons & Dragons since the early Eighties, and I’ve always been fascinated by the art. This was where I’d go to see monsters, to see magic, to see adventure. I’d spend hours flipping through the pages of the books, letting the illustrations inspire my own imagination. Today, it still inspires my imagination, and I’m so happy that Nacelle can help us share it with the world,” said one of the film’s co-directors, co-producer and director of photography, Brian Stillman. “Eye Of The Beholder showcases how Dungeons and Dragons has evolved in to much more than just a game, it’s become a cultural phenomenon that has stood the test of time.” said Brian Volk Weiss, Founder and CEO of The Nacelle Company. Using an Adobe post-production workflow, the team easily organized and edited footage in Adobe Premiere Pro CC, edited and fixed audio and mixed music tracks in Adobe Audition CC, and even added animations created in Adobe After Effects. Comedy Dynamics’ VP of Acquisitions Anna Roberts negotiated the deal with Seth C. Polansky, Esq. Spun off in 2017 by Brian Volk Weiss, The Nacelle Company develops, produces, and distributes feature and documentary films, TV shows – both scripted and unscripted. Nacelle’s vast array of partnerships include: Netflix, HBO, Discovery, A&E Networks, Hulu, Amazon, Viacom, and many more. Via its renowned video and record label, Comedy Dynamics, established in 2007, Nacelle is one of the largest independent producers and distributors of comedic television, film, and stand up comedy. The Nacelle Company is also responsible for the production of the hit Netflix docu-series, The Toys That Made Us.